^ 冈比亚国家概况. 中华人民共和国外交部. 2016-07 [2016-12-03]. ^ 2.0 2.1 2.2 2.3 The Gambia. World Economic Outlook Database. International Monetary Fund (IMF). April 2016 [2016-06-25]. ^ 4.0 4.1 Adama Barrow removes Islamic from Gambia's name. naij.com. 2017-01-29 [2017-02-27]. 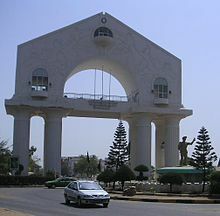 ^ Why Africa's 'smiling coast' is officially referred to as 'The' Gambia. www.africanews.com. [12 September 2018]. ^ La Gambie s'autoproclame "État islamique". Europe 1. 13 December 2015 [2015-12-14] （法语）. ^ 冈比亚宣布成为伊斯兰共和国 标志着与英国决裂. 环球时报. 2015年12月14日. ^ 岡比亞改名岡比亞伊斯蘭共和國. now新聞. 2015-12-14 [2015-12-15]. ^ Gambia: Defeated leader Jammeh leaves country after election loss. CNN. 2017-01-22. ^ Gwillim Law. Districts of Gambia. (www.statoids.com). 2004-01-09 [2014-07-12]. （原始内容存档于2014-06-26） （英语）. ^ 冈比亚国家概况. 中华人民共和国外交部. 2016年7月 [2016-09-07]. ^ 冈比亚共和国与台湾方面断绝外交关係. 自由亚洲电台. 2013-11-15 [2016-09-07].